The Pay per Use subscription, enables your to use all of our modules on any node you wish. With payment deferred to the end of the month, based on your actual usage. This enables you, for example, to use our modules to configure your Docker containers or any Cloud service. When you purchase a pay per use subscription, you can use all of our modules on any node you wish. This enables you, for example, to use our modules to configure IBM messaging middleware, Oracle database and WebLogic middleware in your Docker containers or any Cloud service. When you purchase a Pay per Use subscription, you get taken to the shop and have to register with your Credit Card information. At this point, we will only charge an entry fee for a subscription to your credit card. After the subscription is validated, you can download the pay per use license (entitlement) from your account page. Check here how you can put the entitlement file in the correct location on your puppet server. The entitlement file contains your unique subscription and is linked to your account. All modules that are activated using this entitlement file are added to your account. Whenever you start a puppet run, either manually or scheduled by the Puppet server, Puppet checks all resources that are activated. By activated we mean that they are part of the current manifest and part of the catalog. Whenever this is the case, puppet connects to our API server and registers an activation. At the end of the month, we will add all activations, and charge the total amount to your credit card. On your account page, you can see and download the invoices. Puppet version 4.0 or higher. 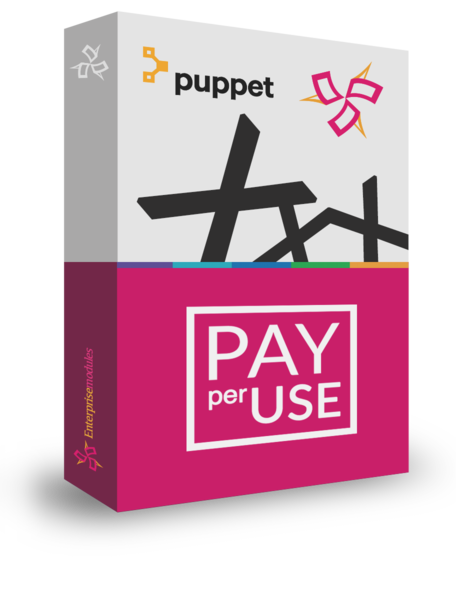 Can be Puppet Enterprise or Open Source. Have direct access (no proxy) to the Internet. The modules will need to connect to node api.enterprisemodules.com on port 80.